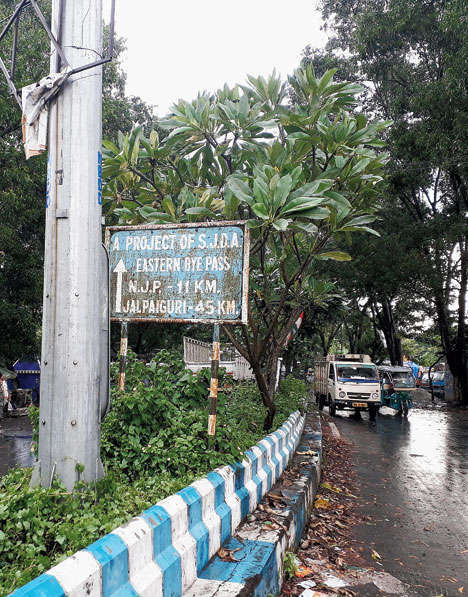 Siliguri: The state PWD has decided to widen and improve Eastern Bypass, an 11km road that skirts Siliguri and connects the north-eastern end with southern end of the city. The decision has come as a major relief for Siliguri residents and also those living in the surroundings as once this road is four-laned, it can largely help in movement of traffic while bypassing the arterial roads of Siliguri, which get clogged with vehicles every day. Built by the Siliguri Jalpaiguri Development Authority (SJDA) couple of decades back, the road connects NH-31 near Bhaktinagar police station on the north with Gora More, a tri-junction near New Jalpaiguri (NJP) station. Around nine months back, the road was handed over to state PWD. "After the handover, it was decided that the entire 11 kilometre-long stretch would be widened and would have made a four-lane road to ease the movement of traffic. Recently, tender process for the work has been initiated," said Chandan Jha, the executive engineer of North Bengal Construction Division of the state PWD. According to him, a sum of over Rs 15 crores would be spent for the project. "The road would be two-lane on each side, with dividers in the middle. We would also build drains all along the stretch. Work is likely to commence in another three-four months," added the official. Sources in the Jalpaiguri district administration - it is under Jalpaiguri district - said no land has to be acquired for the project. "There is adequate government land on both sides of the road. We will not have to acquire any land for widening of the road," said a source. As of now, most stretches of the bypass are in bad shape, particularly after the recent monsoon rainfall. The bitumen cover has wiped, there are innumerable potholes and even craters in some places. "Some repair works would be carried out in the damaged stretches but the main construction would be done as a part of the four-laning project," said a source in the state PWD department. The move has been welcomed by residents of the city. "Several vehicles which enter the city from Sikkim, Kalimpong and parts of Dooars and vice-versa, go to NJP station through Hill Cart Road or Burdwan Road every day. Only a few uses Eastern Bypass. Once the road is four-laned, this traffic can be diverted along the bypass. This would ease the load of traffic in Siliguri," said Jayanta Majumdar, a transporter based in Siliguri. The four-lane road would also help in movement of vehicles to Jalpaiguri and beyond, pointed the residents. This is because from Gora More, the southern end of the bypass, NB development department has developed an alternative road that heads for Jalpaiguri, cutting across the canal road that heads to Gazoldoba, site of the mega tourism hub. The state PWD has decided to widen and improve Eastern Bypass, an 11km road that skirts Siliguri and connects the north-eastern end with southern end of the city.